"The three young soldiers in the story are best friends from school, and they leave New Zealand together to go and fight at Gallipoli. Landing first in Egypt, they travel by ship to Anzac Cove and dig into trenches to fight the Turkish troops holding the peninsula. Conditions are... read full description below. 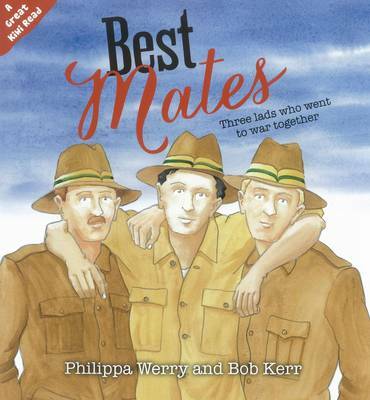 "The three young soldiers in the story are best friends from school, and they leave New Zealand together to go and fight at Gallipoli. Landing first in Egypt, they travel by ship to Anzac Cove and dig into trenches to fight the Turkish troops holding the peninsula. Conditions are tough and Joe gets sick, but his mates help him off on the hospital ship. Then Harry is fatally wounded and his burial has to take place on the cliff-top, away from the snipers. The three friends are reunited many years later, when the two men fly to Gallipoli and lay poppies on Harry's grave"--Publisher information.